Circor Energy's GO Regulator, has added a new product to its broad line of pressure regulating products. The Model GHR is a hydraulic pressure control valve targeted at applications that include wellhead control, blowout preventers, hydraulic power units, subsea actuator supply, testing applications, ballast control, and more. 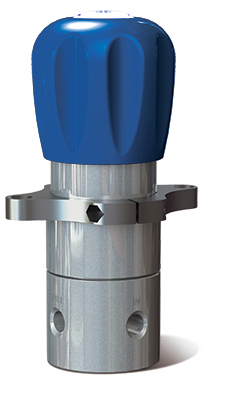 The new GHR Series provides a compact, durable, and highly accurate regulator for hydraulic systems. The control knob provides a low torque, ergonomic way to set the control pressure. Standard body material is 316 SS and the unit is available in 3 port variants and multiple mounting options. I have included a data sheet for the GHR series below which provides additional detail and some cutaway illustrations of the regulator. Share your pressure regulation applications and challenges with product application specialists. They can assist in product selection, proper sizing, and configuration to meet specific application requirements. Hydraulic pressure control regulator model ghr go regulator from Hile Controls of Alabama, Inc.